Vietnam is a popular destination for many adventurous tourists to enjoy street food, pagodas and beautiful landscapes. 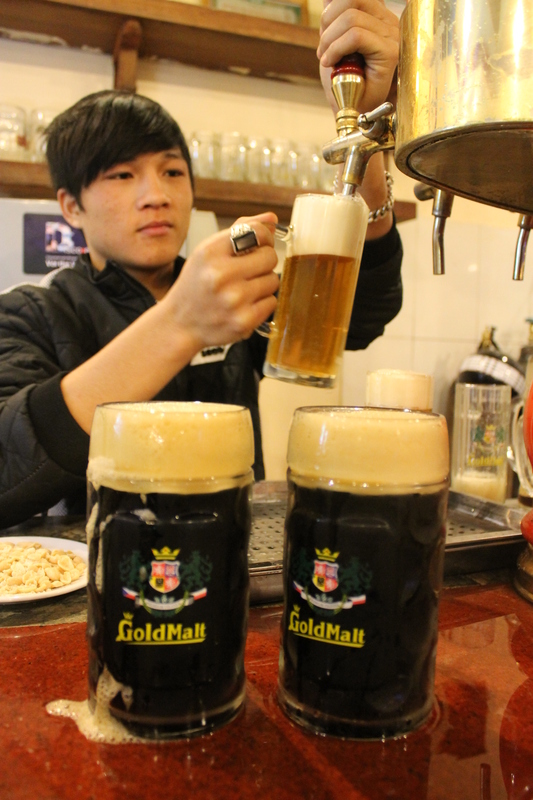 One other distinct experience is the Bia Hoi beer which predominantly can be found along the narrow streets of Hanoi. Bia Hoi is a fast produced and light beer made of rice, malt and sugar, often served more or less directly at the street. Bia Hoi is not just the beer itself, it’s also a social concept and experience which includes beer and food, consumed by all social groups under simple circumstances. It’s a tradition that many deals and contracts are sealed during long dinners with food and plenty of beer…. This entry was posted in Activities and news and tagged beer, beer hanoi, beer in Hanoi, beer in vietnam, beer prices vietnam, czech styled beers, goldmalt, Hoa vien brauhaus, microbreweries Vietnam. Bookmark the permalink.